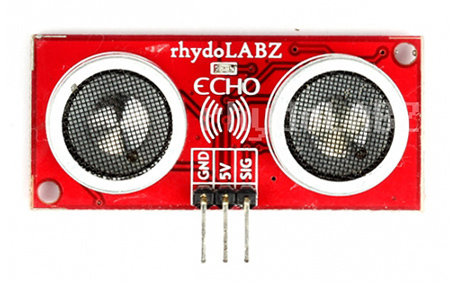 Description: The "ECHO" ,Ultrasonic Distance Sensor from Rhydolabz is an amazing product that provides very short (2CM) to long-range (4M) detection and ranging. The sensor provides precise,Stable non-contact distance measurements from about 2cm to 4 meters with very high accuracy. Its compact size, higher range and easy usability make it a handy sensor for distance measurement and mapping. The board can easily be interfaced to microcontrollers where the triggering and measurement can be done using Single I/O pin. The sensor transmits an ultrasonic wave and produces an output pulse that corresponds to the time required for the burst echo to return to the sensor. 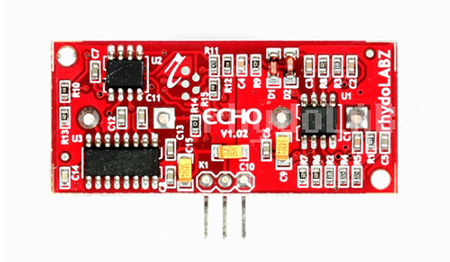 By measuring the echo pulse width, the distance to target can easily be calculated. How much current does this module consume? Current consumed by Ultra Sonic Distance Sensor (PWM O/P) is less than 20mA. & what will be the measurement range for such surface , whether it is more than 3 feet? Yes It will, but the accuracy may reduce.Even though we tested up to 600cm , normal guaranteed range is 2cm to 400cm.